The litter name theme was movies starting with "B". Breeding was performed via surgical AI June 5, 2012. Born: August 5, three males (all full tails) and two females (one full tail, one long stub). Tempest has OFA Good hips and CERF normal eyes. 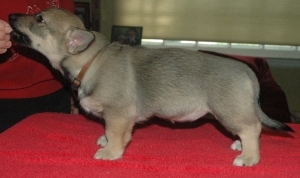 He has a docked tail (born with a full tail). The whelping box names (what we call them while they're here) were Aniston, Beals, Connelly, Donnelly and Esposito - all the last names of famous Jennifers, in alphabetical order, because the puppies were born on my sister Jennifer's birthday and that meant we couldn't spend her birthday with her! 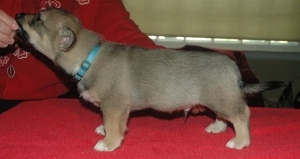 Lobo became the first Alkemi puppy to title in Barn Hunt on January 26, 2014 when he earned his Novice title (RATN)! 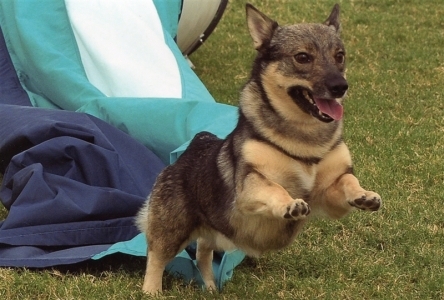 AND he became the first Swedish Vallhund (with one other dog) to earn the Open Barn Hunt (RATO) title in July 2014, and in November 2014 he became the first Vallhund to earn the Senior Barn Hunt (RATS) title! 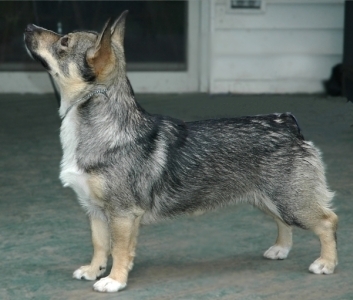 Lobo made Swedish Vallhund history yet AGAIN on November 1, 2015 by earning his Master Barn Hunt (RATM) title. 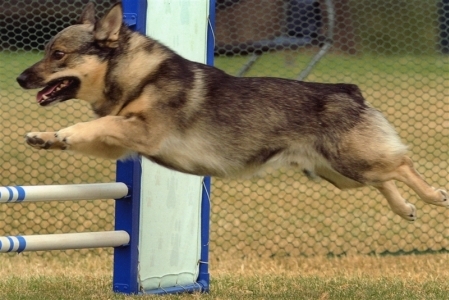 Lobo also became the first Alkemi puppy to earn an obedience title when he earned his Companion Dog (CD) title on May 31, 2014 (he has since earned his Companion Dog Excellent (CDX) and Utility Dog (UD) titles also! 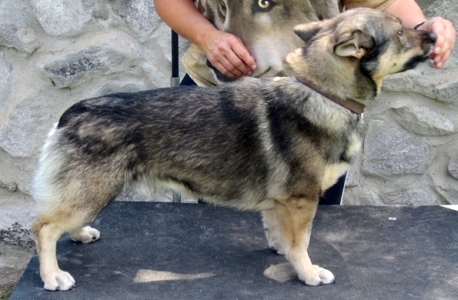 ), and the first Swedish Vallhund to earn a drafting title (Novice Draft Dog, or NDD) on May 31, 2015. 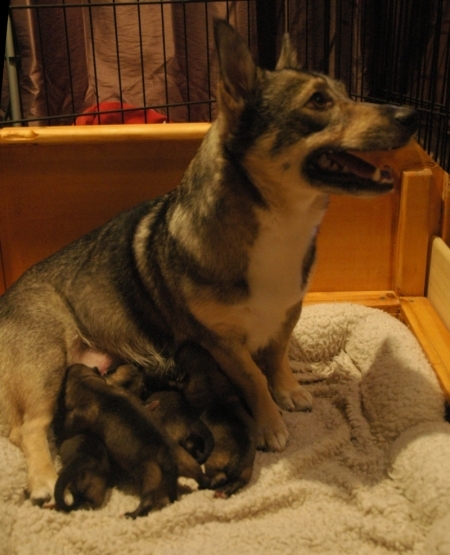 On April 16, 2016, Lobo earned his PT herding title and became eligible for the Swedish Vallhund Club of America's Level 2 versatility award, the Versatile Swedish Vallhund Advanced, the first Alkemi puppy to earn this! 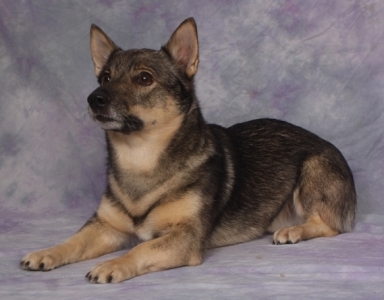 Lobo earned his Level 3 versatility award in October 2017 (Versatile Swedish Vallhund Excellent, VSVX), and has earned titles in herding, coursing, drafting, agility, obedience, Barn Hunt and trick dog! Lobo lived in Walla Walla, WA until September 2016, when he moved to Durham NC with his family. Cricket is learning obedience and agility and passed her first herding instinct test before she turned one! Colby earned his AKC Canine Good Citizen just before his first birthday, and has earned his Novice Agility and Novice Jumpers titles in AKC agility! Ollie passed his first herding instinct tests before his first birthday and is learning agility!